Cheshire East Council: Pure Town Planning’s winning streak continues… We have recently secured planning permission for substantial extensions and a complete “facelift” to an existing bungalow near Stockport. This reinforces the fact that although we are based in Dorset and Hampshire on the south coast we can just as easily handle projects successfully throughout the country. The owners of the property had previously tried and failed to secure planning permission for substantial extensions to their property. Pure Town Planning were called in to put forward and execute a comprehensive planning strategy in order to achieve the goals of the client. 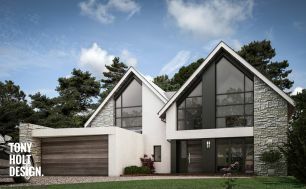 This bespoke proposal was designed by Tony Holt Design who tailored the scale, layout and appearance of the scheme to fit well with the context of the site. Whilst the resultant property was significantly larger than the existing building on the site, because of the initial preparation that was done in order to present the application in the best possible light, it was easy for the appointed planning officer at Cheshire East Council to see that the proposal enhanced the character of the area and gave no opportunities for overlooking into neighbouring properties. You’ve probably heard of the 7 ‘p’s… but you haven’t heard of our version – ‘Pure Planning’s Preparation Prevents Piss Poor Performance’! This certainly proved to be the case in this instance. If you are experiencing planning difficulties and would like some honest, clear, realistic advice then why not give us a call or send us an email and we would be more than happy to offer you a FREE half hour consultation to find out if we can help you too.